With the boys at camp this week it's been just me and Griffin in the afternoons. We've had picnics, danced to the Trolls soundtrack and done LOTS and LOTS of crafting. Today I thought I'd share a super easy one that turned out really cute! It was messy but she did a fantastic job and got everything covered really well... including her hands. While we waited for the paint to dry we headed to the craft closet to find ribbon, paper, fabric scraps, pipe cleaners, etc. in a rainbow of colors along with a pair of googley eyes. We cut various lengths and set them out to use for later. After about 30 minutes the paint was dry so we clipped the clothes pins on and laid out her color strips on the back. Next I just taped the mess out of everything to hold it all down. We glued the eyes on, I drew a little smirk and LOOK HOW CUTE!!! If you're looking to incorporate this into a little "mini lesson" / book club with the craft (maybe read the book after in the morning, then paint, then wrap it up after lunch) be sure to check out THIS BOOK. I couldn't find our copy (boo!!!) 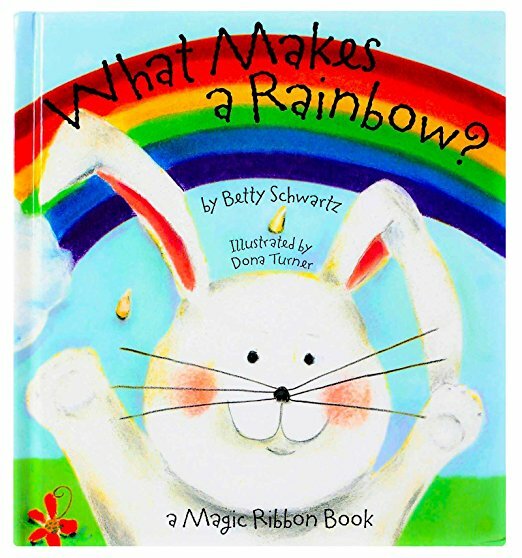 but it is so cute and when you open the pages there are ribbons that appear and make the rainbow as you read! I hope y'all have a wonderful day and have a chance to make your own sunshine-y rainbow soon! Look at how cute this craft is!! Love it! That's so cute and easy! Is Griffin a lefty? I can't remember if you've mentioned that before. So cute! Where is her pink dress from? That is super cute as well! Love!! So precious. And easy!! I love how you do activities that go with a theme or book. Is there somewhere on your blog (or some where else) that I can see your ideas you have done over the years? Wanting for my daughter that is babysitting this summer and she loves to do things like this. Love this! We live on a street with the word Rainbow in it, so this would be so fun for my daughter to make- thanks for sharing! I love this! Super cute and simple - my kind of craft!